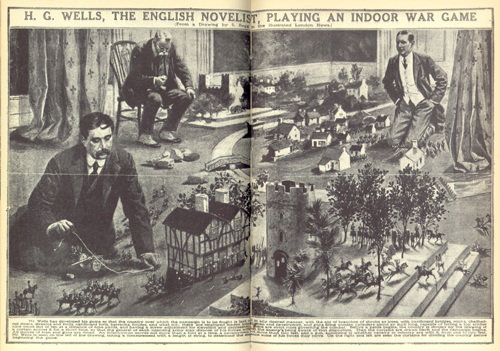 Wargaming by its very nature is a social hobby with a minimum of two players (traditionally, “red” and “blue”) required for the majority of games. Like most social activities, wargaming also carries a “the more the merrier” tradition of loosely affiliated players, local clubs, regional associations and large-scale conventions. By the mid-1960s as wargaming and role-playing games began creeping out of war colleges, living rooms and basements, conventions likewise started their modern ascent of importance. The first Gen Con in 1968 hosted about a dozen players and has grown to nearly 50,000 attendees in the few past years. The Historical Miniatures Wargaming Society (HMGS), founded in 1986, runs a number of regional conventions throughout the year with Fall In!, Cold Wars and Historicon as their major events. Historicon, typically held in July, is the largest military miniatures convention in North America although in recent years a variety of sci-fi, fantasy and alternate history gaming have also grown in prominence. I don’t go to a ton of gaming conventions, but I do try to hit one or two a year. If you’ve been to a convention, you know the glory and weirdness to be found in spending hours upon hours with like-minded gamers. Huge rooms are filled with dozens of beautiful tables, and people running the games often prepare for months to really put on a dazzling show. Lectures, tournaments, how-to workshops, wargaming marketplaces and late night open gaming sessions round out these amazing events. Over the years I’ve looked forward to playing games put on by specific people at conventions each year, and I look forward to playing periods, scales and themes I don’t usually play. If you’re new to the convention scene, have a look at the pics and links and find some time to attend a con for a day or a weekend soon.